Adam Bolen is awarded an IHSAA Class 3A baseball state championship medal. RUSSIAVILLE, Ind. 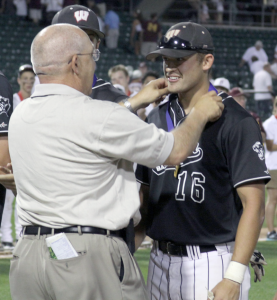 – Fresh off of having an IHSAA Class 3A state baseball championship medal draped around his neck, Western graduate Adam Bolen received a second honor – he was named to the Indiana High School Baseball Coaches Association North All-Star squad. He is the 12th Panther selected and the first since current assistant coach Quentin Brown in 2005. Bolen earned the honors after a season that saw the shortstop bat .373, second on the squad to junior All-State selection Marcus Pingleton’s .375. Bolen, who is undecided on his college choice, ripped 40 hits his senior season, with six doubles, five home runs and a team leading 25 RBIs. He also tallied 32 runs. The 2012 Indiana High School Baseball All-Star Series will be played at the 2,200-seat Alvin C. Ruxer Field in Jasper on July 14-15, with an awards banquet on July 13. The complex is considered a jewel of southern Indiana baseball. Bolen also commented on the return trip from Indianapolis after the Panthers captured the state championship on June 15. Bolen joins two current Panther coaches who also hold the honor of being Indiana All-Stars. Varsity assistant coach Quentin Brown dressed for the North team in 2005 and junior varsity head coach Caden Cline donned the uniform in 2004. In addition, Western Athletic Director Ryan Berryman coached the 2011 squad as the head coach at Northwestern. Cline said he remembers everything about being an Indiana All-Star and is excited that Bolen was chosen to represent the northern part of Indiana. Cline noted that Western has a solid output of strong baseball players, especially in the last decade. With Western claiming the 2012 Class 3A title and owning a county record 15 sectional championships, Cline hopes this will encourage the next generation of Western players to want to achieve the same type of success. But for now, the Panthers will continue to celebrate the state championship. And one former player will play in his final high school baseball series before heading off to college – and Adam Bolen will cherish every moment of that time on the diamond. This entry was posted in Baseball, IHSAA, Western. Bookmark the permalink.